Hi friends! 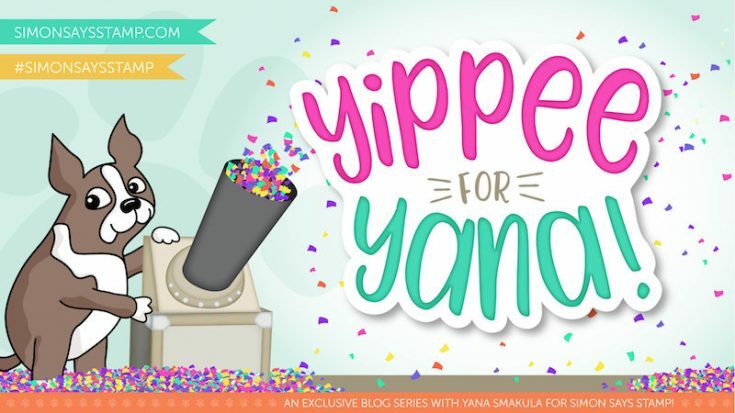 Welcome back to another edition of Yippee for Yana where the amazing Yana Smakula is our special guest and making a gorgeous card for a friend with a pretty assortment of products! Read on for more information and be sure to watch the video and enjoy! Hi everyone, this is Yana Smakula and welcome back for another Yippee For Yana video! If you live in a warmer climate you probably enjoy beautiful greenery outside all year round. But if you are like me, and live in one of the colder parts of the world, chances are, by now you are dreaming of spring, double-digit temperatures (if you are using Celsius system) or above 60 degrees Fahrenheit weather and some nice greenery and flowers. Since Spring won’t be getting to my neck of the woods for another few weeks I’m browsing for Spring online and trying to recreate it in my handmade card. Today I’m bringing you a simple to make floral Friendship card. I’ve started working on my card by creating a background using Quilted Hearts background stamp, White Satin Pearl embossing powder, and light blue cardstock. 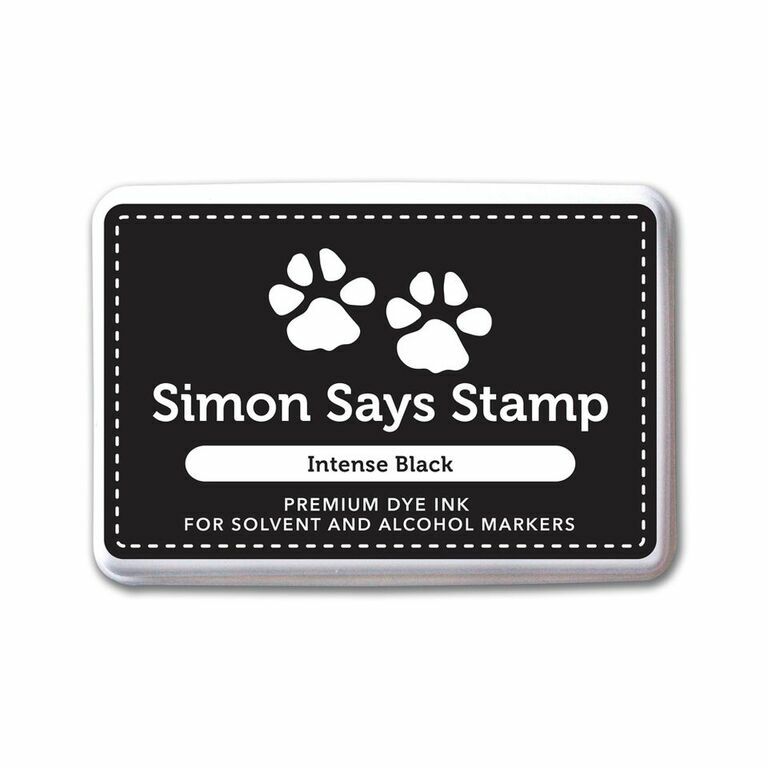 Next, I stamped “Friend” from the Bestiest stamp set from CZ. I used Cloudy Sky ink on white cardstock. I added “Thank You For Being My” in black ink and trimmed latter into a skinny strip with a V-shape at the end. 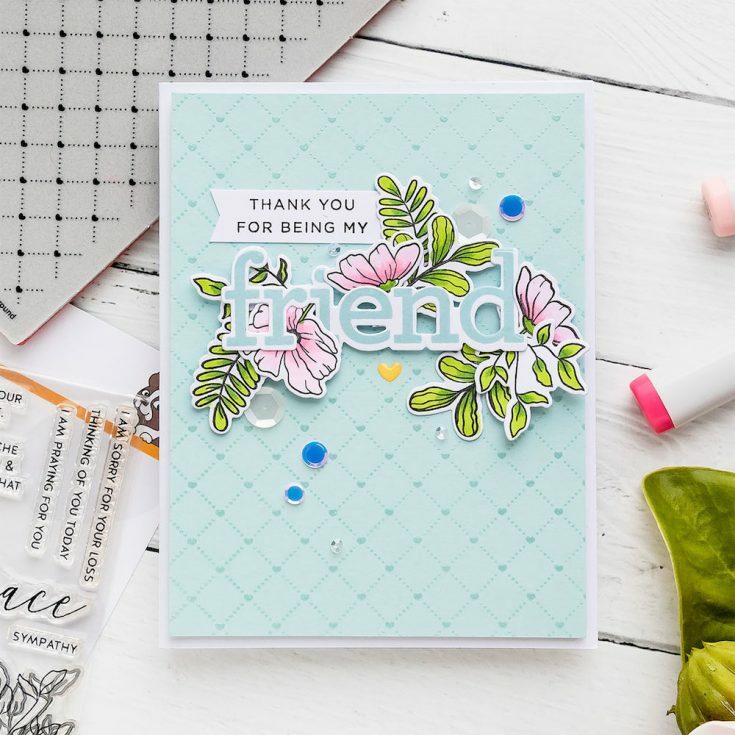 The word “Friend” was die cut using coordinating die. I also stamped a few images from the Moments of Grace stamp set in Intense Black ink on white paper. I used this specific ink as I planned to color these with my Copic markers and this ink will not blend when it comes in contact with alcohol. I used YG03 and YG17 markers to color greenery on this card. For the flowers, I went with RV11, RV10, RV00, and RV13 markers. Using coordinating dies I cut these images out. Next, I trimmed my background panel to 3 7/8 x 5 ⅛” and foam mounted it onto an A2 white side folding card base. I foam mounted the word “Friend” and added florals all around it. I couldn’t resist adding a few embellishments – an enamel heart and some sequins from the Girls Best Friend sequin mix. Thanks so much for stopping by, and thanks to Yana for being our guest! Love soft blue color on the background. FABULOUS! Love the quilted background and soft colors. Such a pretty Spring card! I am certainly looking forward to warmer temperatures, too! Beautiful background design and flowers! What a gorgeous card, I love the embossed background! Pretty card. Love the soft colors. Oh Yana…so pretty!! and my favorite part is that little yellow, whimsical heart! What a great subtile background for the beautiful flowers! Love your card. The stamp set is great. Pretty, I love the background stamp. I already follow by email. What a beautiful blue. Lovely card. Great card! I love this colour!! Beautiful Thanks for the video! Very pretty. Love the soft florals. One of the things I love about Yana is she makes the process look simple and doable. It’s not as easy as I think it will be, but she inspires me to try. Thanks for that, Yana! Oh wow, this is so pretty and spring-y!! Beautiful card, Yana! 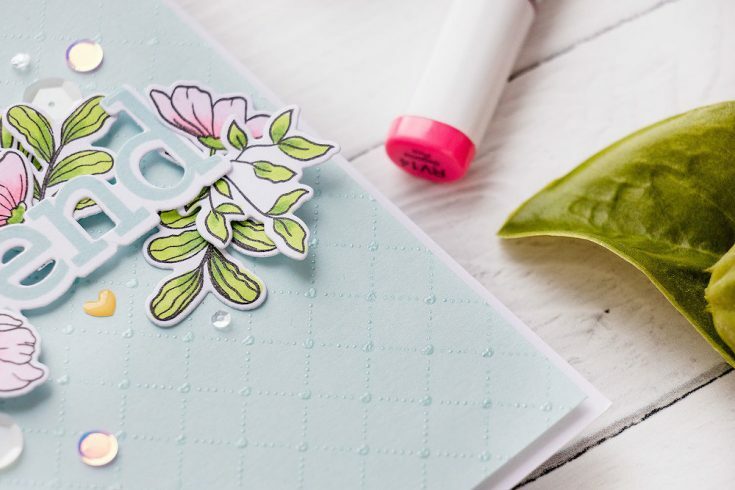 The quilted background is so pretty with the pearl embossing powder. This card is very stunning and the coloring and the card is very well balanced. Beautlful card! Love the balance of colours and the way the leaves and flowers fall around the sentiment. I’ll send you some of the heat from my home city! What a soft, lovely card, Yana! A gorgeous card by Yana! Every element works together perfectly. Yana, your cards are always so pretty. I love your coloring with the copics too. Thanks for sharing with us. Love this pretty card! Beautiful colors and background!!! Soft, gorgeous, subtle, amazing, beautiful. This is stunning and so pretty. What a fantastic card. Lovely card and thanks for sharing. Beautiful card. Love the quilted background! Splash of Color Blog Hop WINNERS! Britta Swiderski Creates with the Simon Says Stamp Brand!